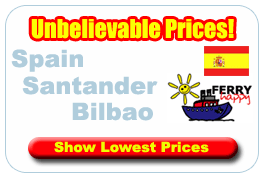 Santander Ferry Port is situated in the breathtakingly beautiful historic city of Santander in the north of Spain.For that perfect holiday why not book your ferry ticket online today. Santander Ferry Port is located in the centre of the city, and is easily accessible by both car and public transport. The city has been built up around the natural port, which has been used since before the occupation of the Roman Empire. The port of Santander is on the Northern Coast of Spain, and provides links by road and rail to the rest of Spain and Portugal. Santander of Northern Spain and the capital of the Cantabria province situated on the nearby peninsula of Magdalena is a truly beautiful spanish city which is fast becoming a major tourist attraction. Cantabria’s capital Santander is an elegant city stretched over a wide bay. Its streets rise up the hill on which the city is built, so views of the Cantabrian Sea can be spotted from much of the town. Highlights include the city’s old quarter, including the historic buildings set against a beautiful backdrop of sea and mountains. The city is built around a natural port, which was in use before Roman times. The surrounding countryside is stunning, with wide-open verdant areas. The sandy beaches are unspoilt, particularly Mataleñas, El Sardinero and La Magdalena, where Alfonso XIII had his summer residence. The Pilgrim's Road passes through the city to Santiago de Compostela and the neighbouring Altamira Caves, both of which have been designated World Heritage sites. Santander also provides a gateway to the Natural Parks of Oyambre, Peña Cabarga and Saja-Besaya, and the beautiful Picos de Europa National Park. There are two main areas of the city of interest to visitors: the centre and El Sardinero. The centre is where you will find most of the shops, monuments and tourist attractions. El Sardinero is a beach resort less than 3km from the city. Santander has three beaches: Playa de Castaneda, Playa del Sardinero, and Playa de la Concha. If they become too crowded, take a short boat trip to El Puntal, a beautiful beach that is rarely crowded, even at the height of summer.